Betty Williamson points out the problems on her street. She is the owner of the home behind her, A Gene Leedy Mid-Century Modern design from the late 1950’s. She asked him if he knew Robert Leedy, the artist. Lola & Ed couldn’t believe the connection and drove by to see the house in Lakewood at 1663 Shirl Lane, a street off of San Jose Boulevard. Richard gave them the street address. They were headed to Avondale for lunch. I was leaving my studio at the same time they called me. We agreed to meet for a bite to eat. They told me the story and I could not believe it. I had never heard of a Gene Leedy house in Jacksonville. It had to be a mistake, I thought; maybe another Mid-Century Modern that merely resembled a Gene Leedy house? As far as I knew, the only ones I was aware of were in Winter Haven, Lakeland, Orlando and Sarasota. The SUV slowed and I recognized Ed & Lola. I think they were just as excited as I was. “If you’re talking about this place [pointing to the house on the right], we’re barking up the wrong tree,” I said as I rolled down my window. They drove on and I continued down Shirl Lane still skeptical of finding a Gene Leedy house. I got to the cul de sac and the first thing to catch my eye was a McMansion that obviously had been a victim of the economy and a resulting foreclosure. Children’s toys littered the yard and the large five-car garage door appeared to be rotting. A car was in the driveway so, hopefully, someone was home. I walked down the walkway and rang the doorbell. No one answered. I rang again. There was no answer. I wondered if the owner was an elderly person: while we were in the Mellow Mushroom eating lunch, Ed checked the city records for the address on his iPhone. We were surprised to see that the most recent transaction was in the Sixties’. An Easter egg wreath on the door told me that the inhabitants weren’t grumpy old hermits. There was no peep hole in the door and I wondered if there was an elderly woman who was afraid to open the door to an unexpected visitor she could not see. I rang the doorbell one last time and turned to go back to my car. I walked in and couldn’t believe how similar it was to my father’s house (he still lives there) – my birthplace! The woman introduced herself as Mary Jane Williamson. Standing in the kitchen, I told her I could tell her the entire layout of the house. She was amused as I listed and explained the rooms then told me I was completely correct. The layout of the kitchen and dining area was the first giveaway. There were jalousied windows (original I am sure) and a set of sliding glass doors which opened to the front courtyard. The other dead giveaway was the utility closet directly across the courtyard from the kitchen. It’s yellow door appeared to be the original. The kitchen / dining area looking out to the courtyard. My father’s house in Winter Haven has an 8-foot concrete block wall instead of a wooden fence. Mary Jane also mentioned that they had tiled the floors after the cork flooring had disintegrated. This was another dead giveaway: My father replaced his some 40 years ago with parquet flooring. Missing were the cypress ceilings. The Williamsons’ ceilings were either sheetrock or plaster painted white. Mary Jane did not know if they were original or not. I thanked Mary Jane for allowing me in and started to leave. Betty arrived minutes later with her granddaughter, Mary Jane’s daughter, from school. “GENE Leedy’s son?” she said with a big smile from a suspicious gaze. “Yeah, that’s him,” I said with a quick smile. Betty & I talked about the history of the house. 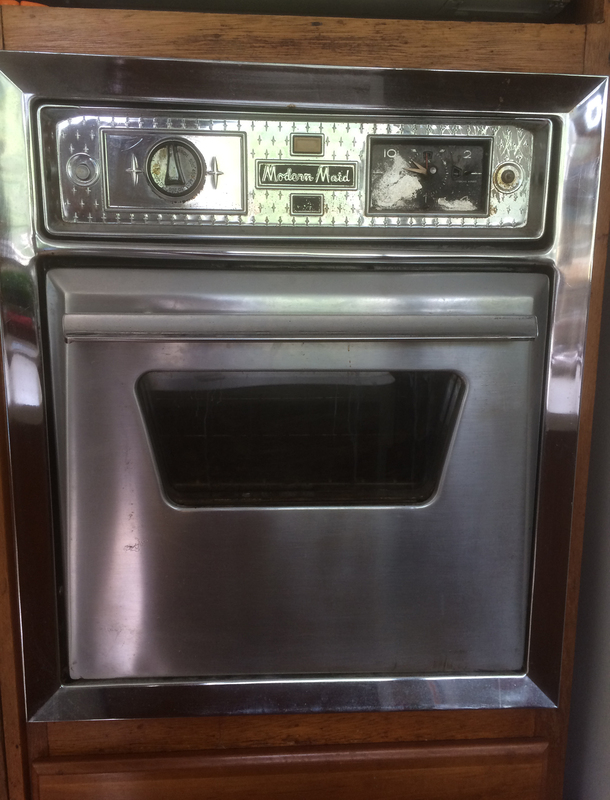 She said it was built in the late 50’s and she seems to think there was a second owner before she and her optometrist husband, Bill, bought the house in the mid-Sixties. She said there was a Bob Broward house on the street and that architect Jack Diamond once lived in a house across the street, a few doors down. I asked her if she knew Wayne Wood and she said she had met him many, many years ago. Her husband and Bill Wood, Wayne’s uncle, were friends. Betty’s smile went to a frown. “Consolidation? I wasn’t too happy with that.” I asked why. “Why don’t you rally the neighbors and go to a City Council meeting one night?” I asked. Betty mentioned that Rick Weller, a local artist (I don’t know him), lived across the street and was always buying up Mid-century Modern homes. By now, we were outside and I was getting ready to leave. “Call me if you ever want to sell this place,” I told her as we shook hands. “Rick has already asked me that,” she smiled. As I left, I took one last look at the twin house I was born in. 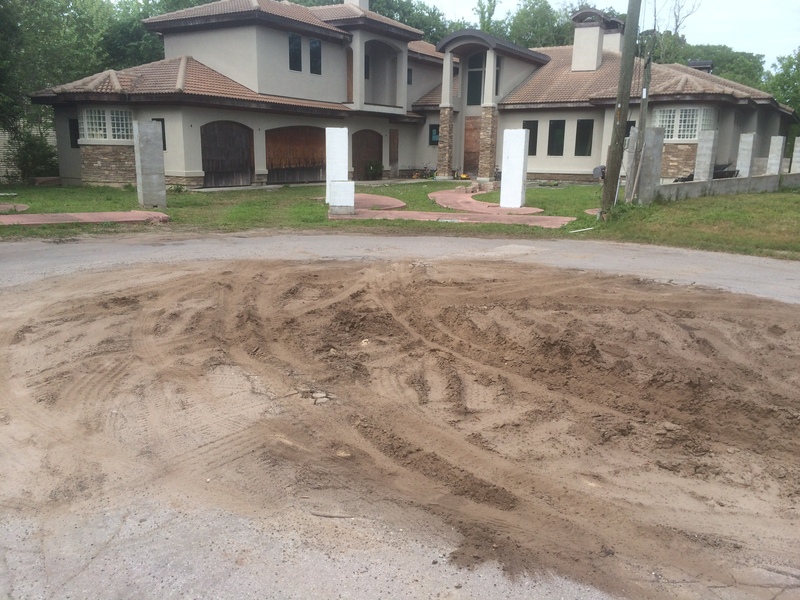 I also looked at the large hole in the cul de sac and hoped someone would come to Betty’s and her neighbors’ aid. The bank foreclosed McMansion across the street. Betty says someone has already purchased it and is planning to make repairs. Notice the mess made in the cul de sac. I told him about it briefly. I haven’t talked to Dad about it. He probably has forgotten otherwise, I would have already heard about it. What a pleasant surprise, your dropping by. and I never know when I’m going to see him. I love your card. Thank you. Perhaps I can help Betty out and get Lori Boyer, Wayne Wood, Ken Amaro, or Eddie Farrah on this cul de sac / street problem? Thanks to Ed & Lola for this unique little find. You used up my entire afternoon but it was well worth it! The house I was born in. 1518 Drexel Avenue, Winter Haven, Florida. The photo is probably 1957…that’s Mom – and me in the tub. (hey, umm, would that sentence sound creepy to a blind person?) 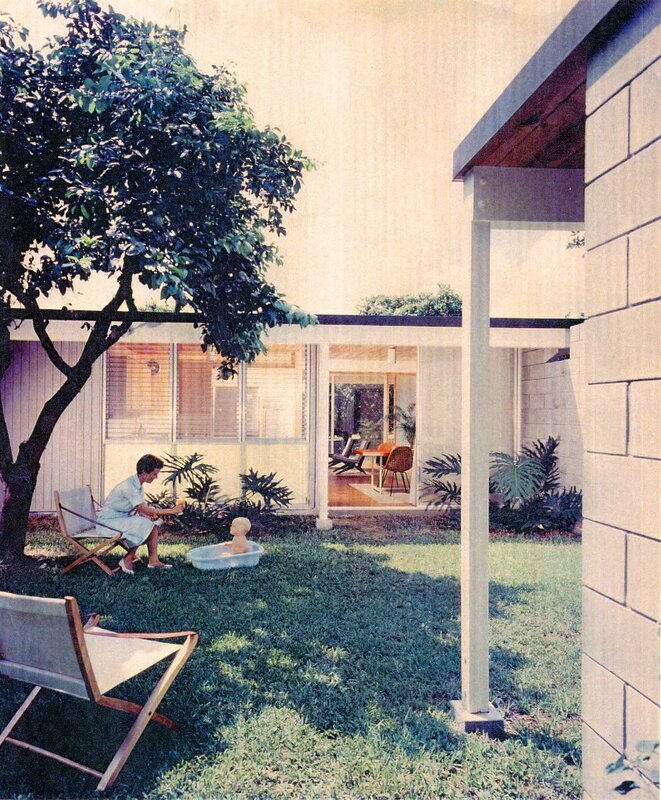 This photo appeared in a Better Homes & Gardens magazine where the house was awarded “First Five Star House for 1959”. The same article might have been the article that inspired Richard West to contact my Dad, Gene Leedy to purchase the plans to build the house in Jacksonville that Betty Williamson now lives in. Betty’s house is a mirrored twin to this one. 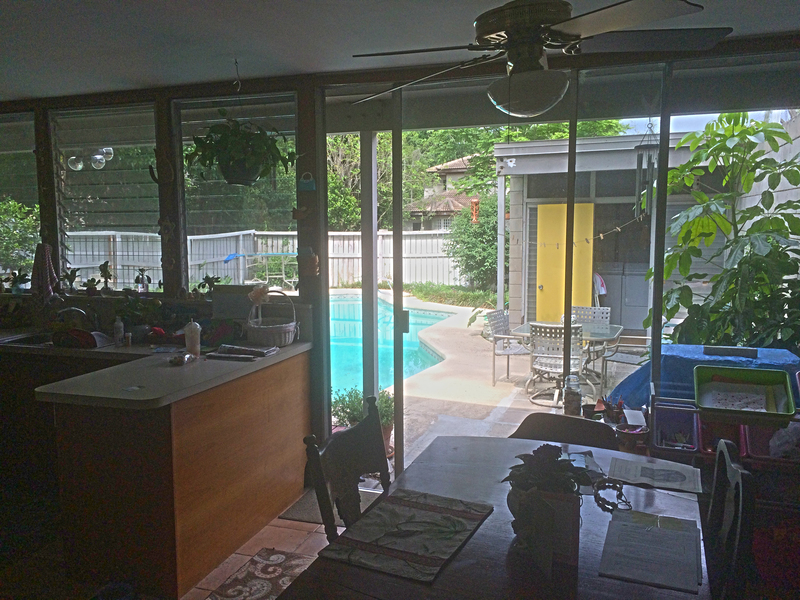 Notice the yellow panels under the kitchen’s jalousie windows: Betty’s original utility room door is the same color. I believe this photo was taken by architectural photographer, Alexandre Georges.